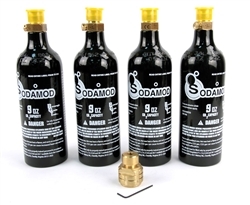 Simply screw SodaMod-C adapter on the tank and then into your Cuisinart machine.The SodaMod-C replaces the proprietary Cuisinart CO2 tank with a standard pin valve CO2 tank. 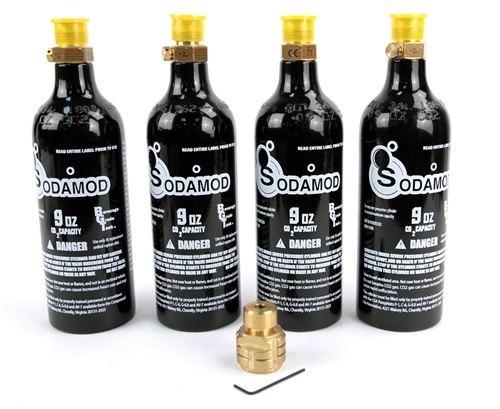 This package includes the SodaMod-C a USA made brass adapter that it fits into the Cuisinart unit. 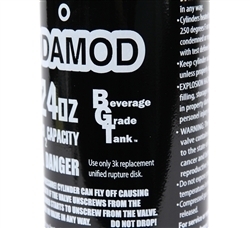 Simply fill the Paintball CO2 tank with CO2 at any sporting goods, paintball store or gas supply house for $3.00-$5.00 (average price) instead of the $20.00 that the 4oz Cuisinart tank costs. Then screw the SodaMod-C adapter onto the tank and insert it in the Cuisinart unit just like you would with the standard Cuisinart tank. The Cuisinart unit with the SodaMod-C will look and perform the same as the standard Cuisinart unit while saving you money. I had a problem with the connection to my unit, It would not add CO2 into. Called them and they overnighted a replacement adapter. It still didn’t work. I spoke to Jon-Paul, again. He identified the problem...It was ME... I didn’t fill them. Filled them today, amazingly it works! Thanks so much for your help!